With Halloween coming up I’ve been seeing a lot of people posting about their costumes on Instagram, so I thought I’d do a round up of some of my own costumes from past years. There were always so many fun opportunities to dress up when I was at uni and I could definitely compile a much longer list, but seeing as I didn’t feel like spending hours trawling through old facebook photos, I thought I’d just narrow it down to five of the more recent ones! 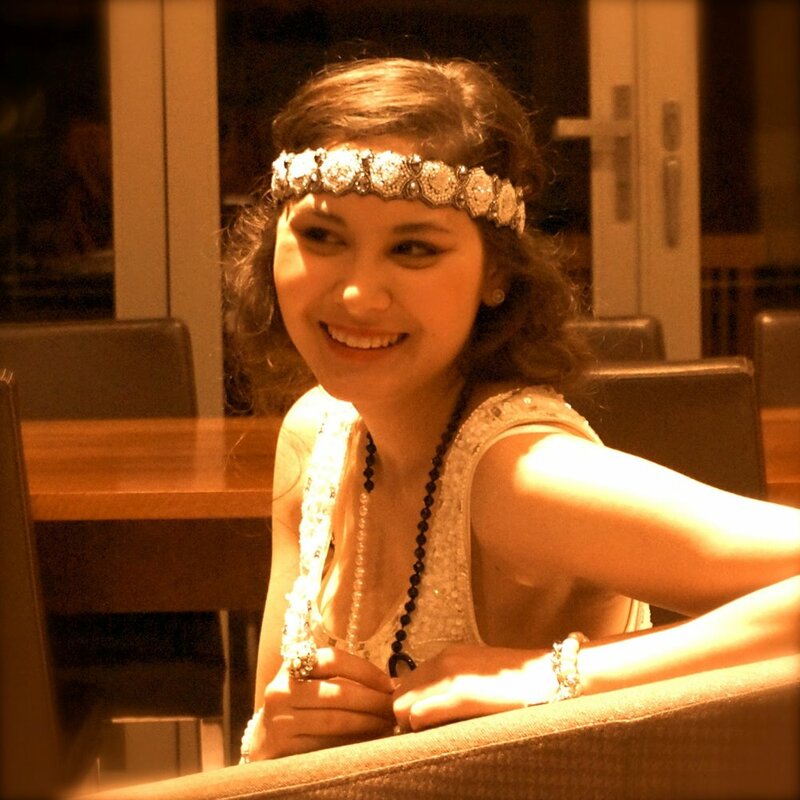 When it comes to costumes, I love putting pieces from my own wardrobe together in creative ways, adding in something from our dress-up box or that I’ve picked up at an op-shop and experimenting with a fun makeup look! I find that half the time, if you can do cool makeup, you can get away with a really simple costume! Hopefully this can provide you with a little inspiration and spark some creative ideas of your own! The makeup is inspired by The Vampire Diaries and I used a black eye-liner to draw on the veins around my eyes, blending it in and smudging so that it looks like it’s coming “out of the skin” rather than just having black lines drawn on your face! In terms of the costume, this black lace top is something I already owned and I pinned an old jewelled brooch to a black ribbon - creating a choker to wear around my neck. I find it’s the little details that can really make a costume and often you’ll already have these accessories at home, it’s just about using them in creative ways! For this outfit, I layered it over a dress which I already owned from French Connection and added a sparkly headband that I bought specifically for this party from Mimco. 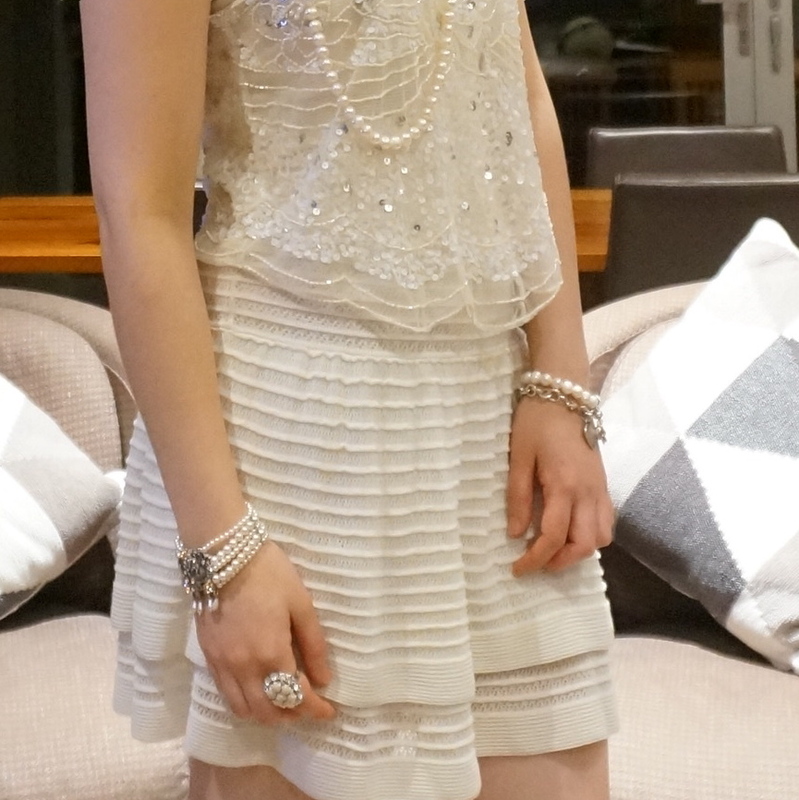 You can see more photos of this look in this old post “Great Gatsby: Sparkles, Pearls and Bow Heels” as well as this more recent one about my Hen Party. I thought I’d throw this one in for a bit of fun and to show you that it’s really just about using your imagination and putting pieces together in interesting ways! I believe this was for an “Under The Sea” themed uni party. For the fish inspired makeup I used the trick of putting a fishnet stocking over your face and dusting eyeshadow on to create the “scales”. In hindsight it would probably be better to use a brighter coloured eyeshadow for this as it did kind of just blend into my skin, but it was a fun look nevertheless! I also added some very orange lipstick! 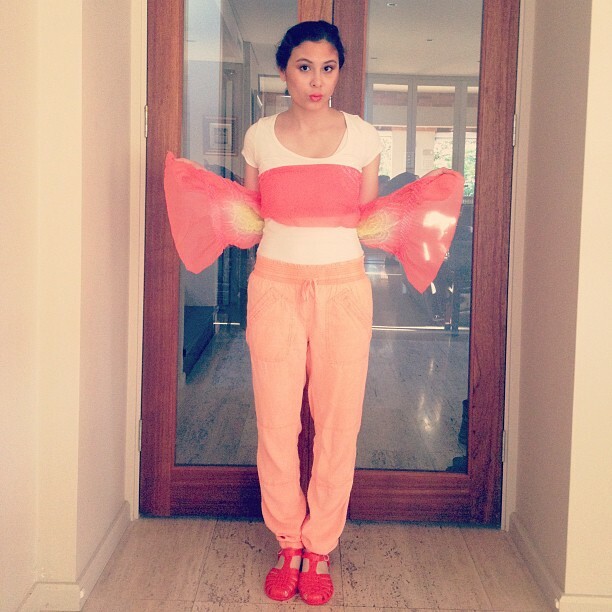 For the outfit, I popped on these bright orange pants that were my sisters and found a piece of fabric in our dress-up box to wrap around me for the fins. Somehow I also found orange jelly shoes too! This is my sister Anabelle dressed as a bat! I drew some bat wings around her eyes and we made little ears out of cardboard and added a few feathers to them. We then pinned them to the hood of a black cloak that we had in our dress-up box. The cloak was something we made many years ago as part of a Harry Potter costume - it’s all about recycling costumes and using them in different ways! This is the most recent costume and you can see more photos of it in this post “A Fancy French Affair - Talking Costumes and Creativity”. 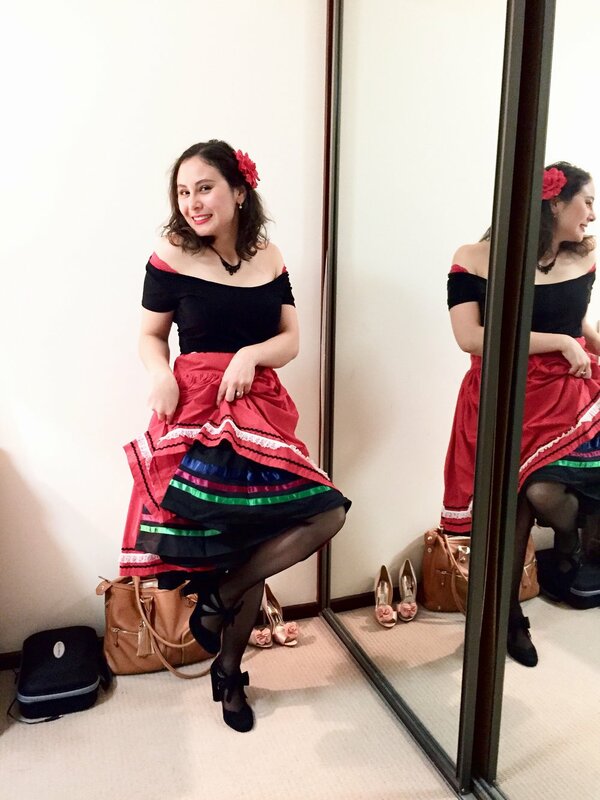 I layered two character skirts that we had in our dress-up box from previous dance concerts, slid down the sleeves of a black top to give that “off-the-shoulder” look (and added a red bra! ), wore my black bow heels, popped on a necklace and pinned a flower in my hair - et voila! - A French Can Can dancer! So there you have it! 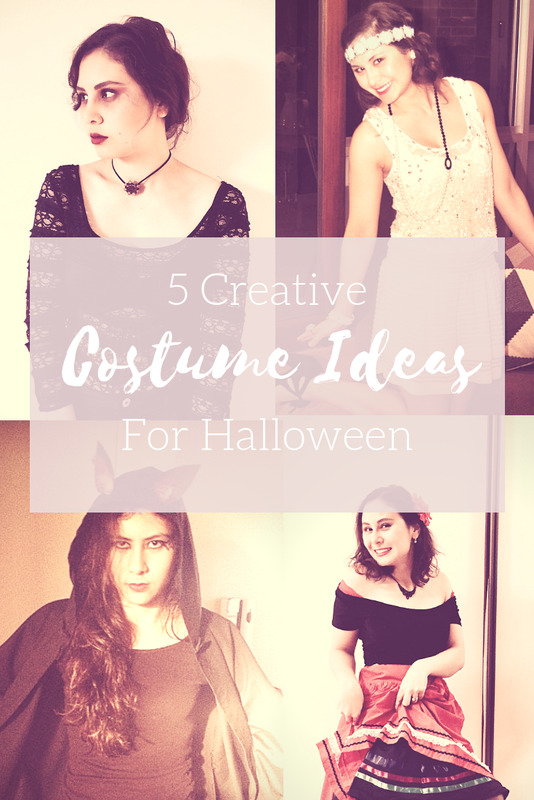 5 creative costume ideas. I hope it’s inspired you and shown that it’s really all about putting things you already have together in different ways, adding in a few new pieces (charity shops are fab for this!) and just experimenting and being creative! I always make such a mess when I’m putting together a costume - I’ll tip out the whole contents of our dress-up box onto the floor and look through all the pieces. It’s like a puzzle that just needs to be put together in a certain way to create some costume magic! Let me know if you enjoyed this post and if you’re dressing up for halloween!